The spine is a flexible mechanical system and performs several important functions. Performing Prolotherapy to the spine for regenerative purposes often restores function completely. The authors investigated and reported on alternative positioning for injecting the lower back and pelvic ligaments. The passive ligament system of the pelvis is very strong and will stabilize the sacrum and pelvis against unwanted motion.5-6 The ligaments that are primarily responsible for control of lumbopelvic motion are the iliolumbar ligament (IL), the long dorsal sacroiliac ligament (LD), the sacrospinous ligament (SS) and the sacrotuberous ligament (ST). The iliolumbar ligament will stabilize L4 and L5 on the ilium and sacrum and is considered a very important pelvic stabilizer.7 The LD, SS and the ST help stabilize the pelvis and subsequently will keep the lumbar spine in check as well. When there is a disruption or weakness in one of the lumbopelvic ligaments, poor control of lumbopelvic motion and muscular imbalances and pain (usually chronic) are the result. Once the clinician establishes what structure(s) are compromised and are part of the pain generating system, treatment can proceed. Treatment planning can include manual therapy, stabilization exercises and Prolotherapy to support the ligament systems and joints.8 Prolotherapy can directly restore the tissues and provide support to joints, aiding motion and helping with muscular control by stabilization and reducing of pain.9-12 When a clinician decides to use Prolotherapy for a patient with low back pain, he/she must decide what solutions to use, but also where and how best to inject the material. Authors (Ann Auburn, DO (AA) and Scott Benjamin, PT, DScPT (SB) had two years of experimental practice on what may be alternative positions for injecting the lower back and pelvic ligaments. SB had a vast history of sporting injuries which resulted in pelvic obliquities which lead him to see AA initially. Together they determined that stressing the ligamentous system using different angles and joint positions, instead of the prone position, could mimic ligament stresses in everyday situations and thus lead to improved effectiveness of Prolotherapy treatments. Their basic experiments involved having the patient flex forward at different angles for the Prolotherapy treatment to better expose the target ligament. Based on previous informal experimentation, the authors determined that two angles, 15 degrees and 60 degrees of lumbar flexion would be excellent choices for injection. We determined this, with the notion that in life you move through these angles during a variety of daily activities so AA and SB wanted to see the treatment effects at those angles on the ligaments. We also hypothesized that with the 15 degree angle, the iliolumbar and the supraspinous ligaments are best reached. We also thought that the dorsal sacroiliac ligament was reachable at the 15 degree mark but wanted to also stress it at 60 since as a person moves the ligaments are stretched in various ways. With the patient forward, we wanted to also inject the iliolumbar, sacroiliac as well as the supraspinous ligaments to create an environment that challenged the ligaments as a person would do so in life. The authors also postulated that this method would allow the Prolotherapy injections to be placed in various parts of the ligamentous structure. For this study, we recruited a female participant who was 39 years old, with a history of low back pain (LBP) due to multiple car accidents and giving birth to three children. She had previous treatment which consisted of manual therapy, exercises, medication and physical therapy modalities. All of the treatments provided relief, but she experienced recurrent pain and “shifting” within her lower back and pelvis. Her pain centered on her sacroiliac joint (SI) and at the L4-L5 and L5-S1 segmental levels on the left side. The ligamentous structures that were painful consisted of the iliolumbar, dorsal sacroiliac, supraspinous and the sacrotuberous ligament. There was more pain on the left side compared to the right. Ligament injections for lower back and pelvis pain are a very positive adjunct along with manual therapy and stabilization exercises.13-15 The ligaments that support the pelvis can help patients stabilize the lumbosacral spine by allowing them to safely perform functional activities and stabilization exercises. Krekoukias pointed out that when the paraspinals are overfiring, the spine appears to move in a stiffer fashion.16 This facilitation goes hand in hand with poor ligamentous and neuromuscular control of the vertebral segment, and leads to degradation of function and recurrent somatic dysfunction. With Prolotherapy, the muscular system can function more efficiently because the improvement in passive spine stabilizing allows better muscle recruitment and restores normal motor control.17-19 Patients who present with pain in their lower back and SI joints may benefit from the procedures illustrated. By stressing the ligaments in different planes of motion (more function, if you will) the physician can expose alternate areas of the ligament as well as increasing the tensile load of the ligament when the Prolotherapy is applied. Our experience suggests that Prolotherapy injections in these positions provide better results than injecting in the prone position only. Using this “new” positioning for functional Prolotherapy for injections of the ligaments around the lower back and pelvis can provide the clinician with another alternative when dealing with patients who experience recurrent lower back and pelvis pain. The Prolotherapy solution used for this patient was made of 2 ccs of 50% dextrose, 1 cc of PQU (2.43 ml Phenol liquefied, 5.73 GM Quinine HCL, 1.26GM Urea USP), 1 cc of Sarapin, and 6 ccs of Procaine. (Fabricated at the Compounding Pharmacy of Wyoming Park, 2301 Lee Street SW, Wyoming, MI 49519). The illustrations will show the ligamentous structures that were focused on and also what treating angle was used. The illustrations are marked for the clinician to see what structures are being focused on. Illustration 1. Patient Positioning. Picture A shows the patient bent over at a 15 degree angle. Picture B shows the patient bent over at a 60 degree angle. Illustration 2. This figure shows the patient with landmarks identified in the lumbar spine, hip and pelvis. Illustration 3. This figure shows the patient in the bent over position at 15 degrees and is showing palpation of the left iliolumbar ligament over the posterior iliac crest. Illustration 4. This figure shows the patient bent over at a 15 degree angle and the needle placement for injections of the L3 supraspinous ligament with Prolotherapy solution. Illustration 5. 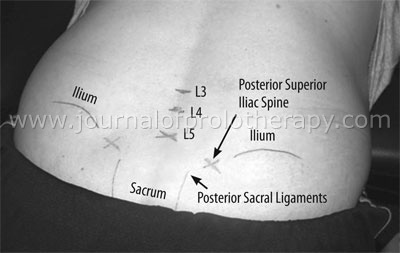 This figure shows the patient bent over at a 15 degree angle and the needle placement for injections of the left superior portion of the sacroiliac ligament with Prolotherapy solutions. Illustration 6. This figure shows the patient bent over at a 60 degree angle and the needle placement for the left lumbosacral ligaments with Prolotherapy solution. IIllustration 7. 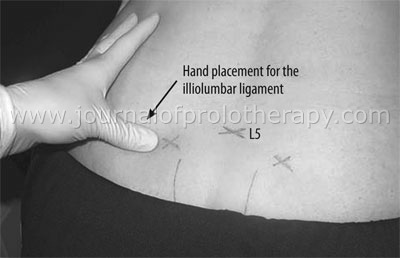 This figure shows the patient bent over at a 60 degree angle and the needle placement for injections to the dorsal sacroiliac ligaments (long or short bands). Positioning the patient bent over at a 60 degree angle will provide more of a stretch to this ligament. Bechtel R, et al. Post Surgical Rehabilitation after Artificial Disc Replacement; An evidenced based guide to comprehensive patient care. (Chapter 1) Jones and Bartlett; MA 2009. Hollinshead WH, et al. Textbook of Anatomy (4th edition) Harper & Row: Philadelphia: 1985. Hackett GS. Prolotherapy in whiplash and low back pain. Postgrad Med. 1960;27: 214-9. Hauser RA. Punishing the pain. Treating chronic pain with Prolotherapy. Rehab Manag. 1999;12;2: 26-8, 30. Panjabi M, et al. Spinal stability and intersegmental muscle forces. A biomechanical model. Spine. 1989;14(2): 194-200. Clemente CD. Gray’s Anatomy (30th edition) Lea & Febiger: Philadelphia: 1985. Chow DH, et al. Torsional stability of the lumbosacral junction. Significance of the iliolumbar ligament. Spine. 1989;14;6: 611-5. Auburn A, et al. Prolotherapy for pelvic ligament pain; a case report. The Journal of Prolotherapy. 2009; 2:89-95. Fullerton BD. High-resolution ultrasound and magnetic resonance imaging to document tissue repair after Prolotherapy: a report of 3 cases. Arch Phys Med Rehabil. 2008;89(2): 377-85. Hackett GS, et al. Prolotherapy for sciatica from weak pelvic ligaments and bone dystrophy. Clin Med. (Northfield Il) 1961;8: 2301-16. Hauser RA. Punishing the pain. Treating chronic pain with Prolotherapy. Rehab Manag. 1999;12;2:26-8, 30. Hackett GS, et al. Prolotherapy for sciatica from weak pelvic ligaments and bone dystrophy. Clin Med. (Northfield Il) 1961; 8:2301-16. Krekoukias G, et al. Comparison of surface electromyographic activity of erector spinae before and after the application of central posteroanterior mobilization on the lumbar spine. Journal of Electromyography and Kinesiology. 2009; 19; 1:39-45. Dagenais S, et al. Evidence-informed management of chronic low back pain with Prolotherapy. Spine J. 2008;8(1): 203-12. Snijders CJ, et al. Effects of slouching and muscle contraction on the strain of the iliolumbar ligament. Man Therapy. 2007.